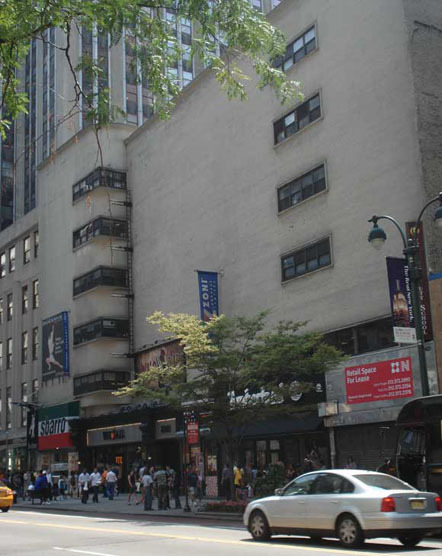 In this post, 34SP's archivist Anne Kumer shares some 34th Street retail history. 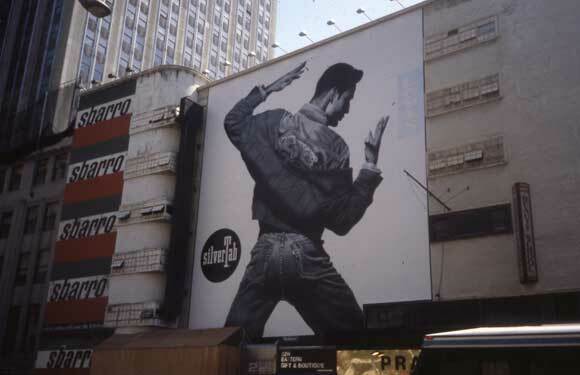 This post also appears on NYC Circa, Anne's history blog about New York City and its public spaces and buildings. Recently, I went shopping with 34th Street fashion guru and Fashion Herald author Tricia, and she noticed the new Steve Madden store, along with a few guys talking in front of it who did not look like tourists, casual passersby, or purchasers of the 5-inch heels Madden is known for. (That last one is an unfair assumption. I have for sure seen many a gent rock a heel way better than I can in this city.) We accosted them, and after explaining what we do for the district, found out that one was the architect for the store. He then dragged us out into the street saying that we were right this minute across from one of the most beautiful buildings in the city. This one -- 22 West 34th Street. I had noticed the building before, but never thought much past why is there would so much wall and so little window. Also, it's backed up against the Empire State Building on 34th Street, so it isn't as if there's nothing else to look at. He had such a glow in his eyes as he described the unusual modernness of this design for the time it was built, that I can only imagine he sees it like this instead. Designed by architecture firm De Young, Moscowitz & Rosenberg, and built in 1934, it's known in my trusty AIA Guide to New York City, and the above photo, as the Spear & Company building. 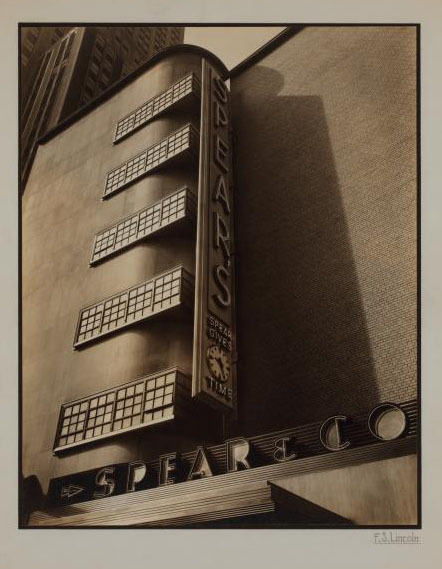 Originally established in Pittsburgh in 1843, Spear's was a furniture store known for selling knockoffs of modern-style pieces. In addition to a whole lot of facade wall, the building was equipped with air conditioning, indirect lighting, and an auditorium, and cost about $300,000 to build. In a 1938 New Yorker Skyline column, Lewis Mumford (also cited in Christopher Gray's 1995 Streetscape column) accused the building's designers of practicing fake functional with that small bank of windows facing east, and covered by the Spear's sign, which was yellow neon on a blue background. 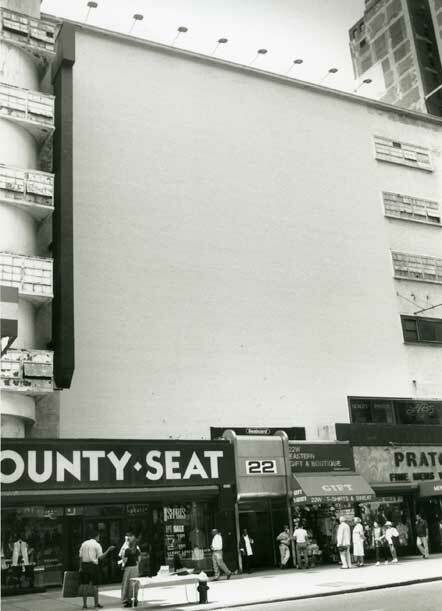 A few years later, and a lot of work on behalf of the 34th Street Partnership, the wall sign is gone, though there is still a remnant of a vertical sign and masked windows. Now thankfully, (scroll all the way up for a refresher), the windows are unobstructed by vertical signage and paint. Mumford would be at least a bit more pleased.